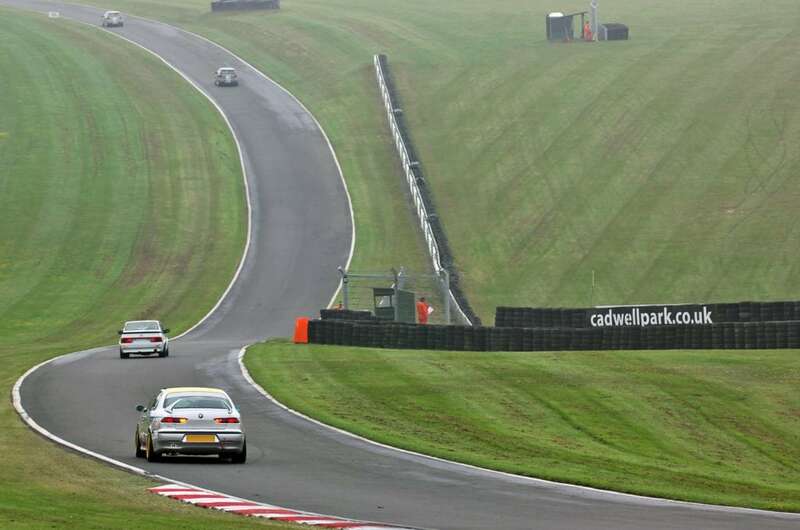 Cadwell Park is a beautiful circuit, set in the Lincolnshire Wolds, very narrow for a modern track, with limited run off in many places, so that a misjudged corner or a slight error can lead to serious consequences (as I know only too well!). 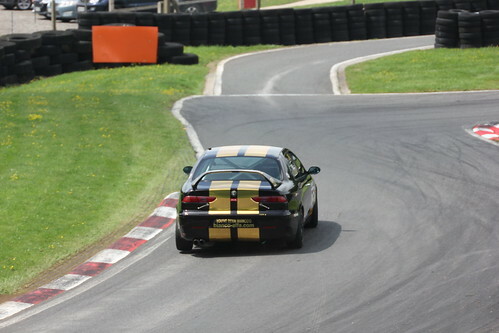 It has steep gradients, both up and down, fast corners and slow corners, long straights and short straights – a real challenge for drivers. 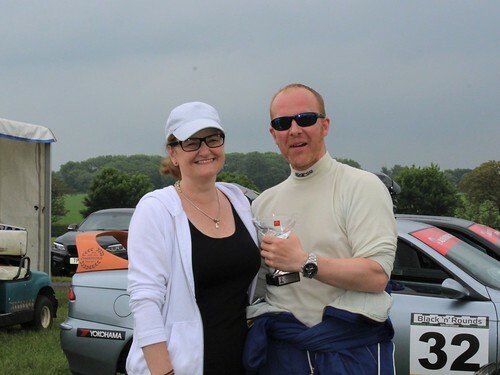 An entry list of 14 cars was a little disappointing, with some who had intended to enter unable to do so, but it was great to welcome Chris Healey back to the Championship after a couple of years’ absence in addition to our regular runners. During the week before the meeting the weather forecast kept changing so we weren’t really sure what to expect. As it turned out, heavy rain overnight on Friday left the track wet early on but progressively drying, so that when we took to the track for qualifying at around 11.00 there was a dry line but very slippery still off line. Timing was a critical factor in qualifying: the progressively drying track ensured that all the quickest laps were set between mid-session and the very end of the 20 minute session, with most of the Modified and Power Trophy cars in particular setting their fastest times in the final 3 laps. All but one had opted for slicks, the only exception being Scott Austin who had opted for slicks on the front and wets on the rear. Tom Hill was first out as is his custom, but unusually did not set his quickest time early on, again due to the drying track conditions progressively improving grip during the session. His first flying lap was a 1:51.381 but on his eighth lap he improved on that by nearly 4 seconds to 1:47.738 to set the Twin Spark pole. Richard Ford was second quickest, posting a 1:48.430 on the 10th of his 11 laps, reflecting his excellent recent form, and 8/10ths quicker than Mike Tydeman who was third quickest. 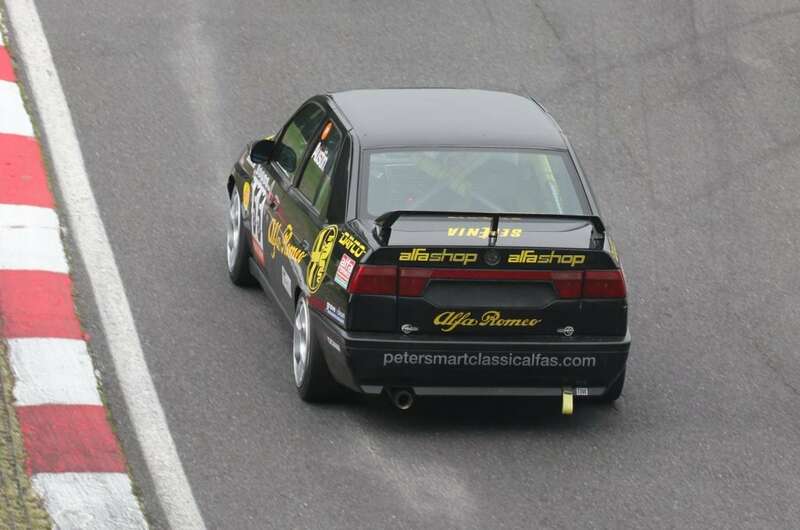 Mike posted a 1:49.217 on his 6th lap but then had to pit with frontal damage after going off and hitting a barrier. 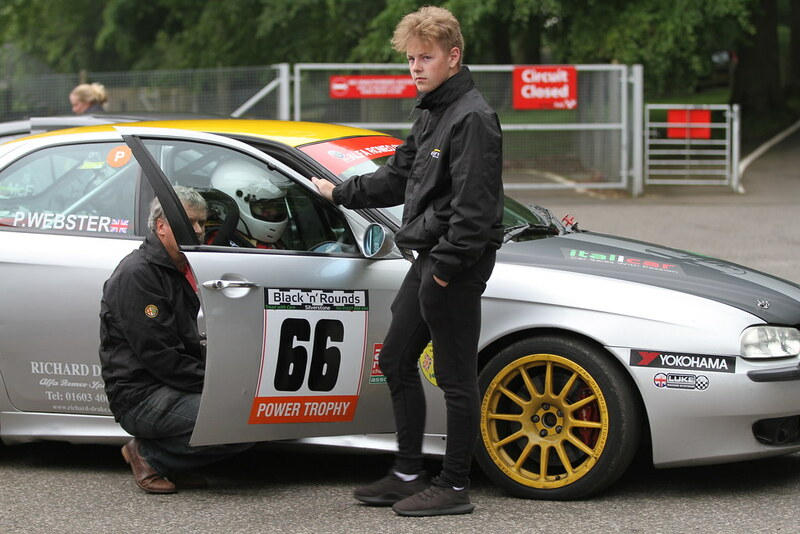 Simon Cresswell was 4th quickest Twin Spark, like Tom setting his quickest time on his 8th lap, a very respectable 1:49.652, pipping Dave Messenger by 3/10ths. 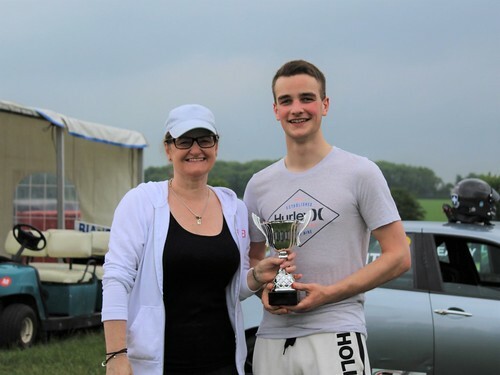 Kristian Leith recorded a remarkably consistent set of lap times – all in the 1:50s and 1:51s bar his first two – with a 1:50.062 to be 6th quickest Twin Spark. 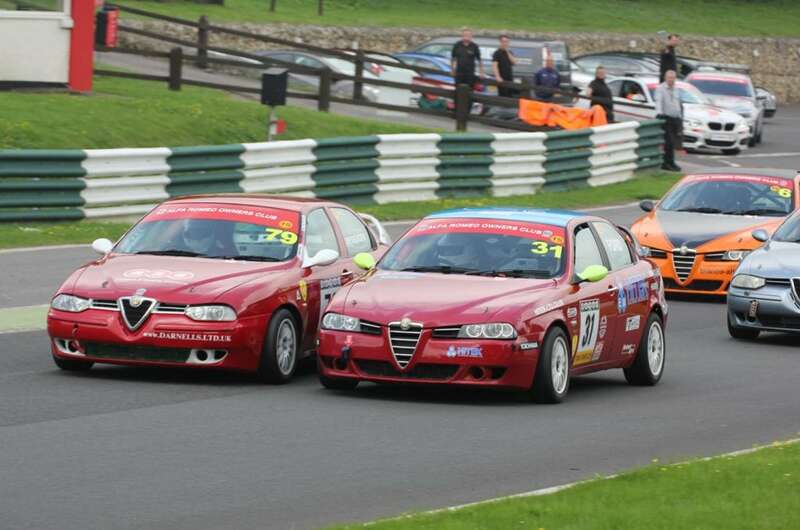 He was followed by Riccardo Losselli, Chris Healey and Andy Inman in that order, Andy slipping two grid places right at the end. 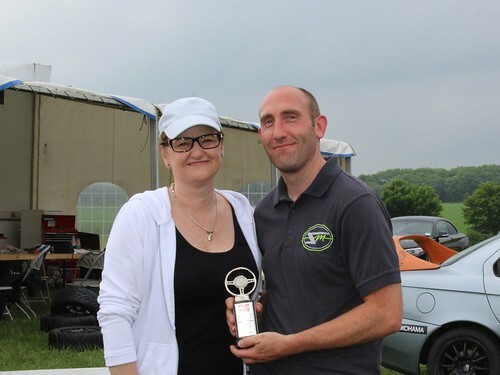 Chris Oxborough was the only Modified class runner with his supercharged 75, and a banzai effort on his 10th and final lap saw him beat his previous best by well over a second, recording a 1:44.114 to set overall poll. 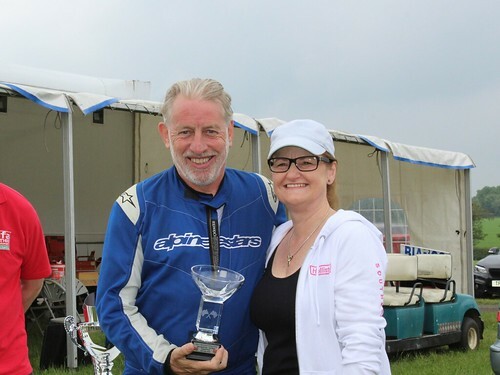 He was given a run for his money by Paul Webster who performed a similar feat on his final lap to go 2nd quickest with a 1:44.454. 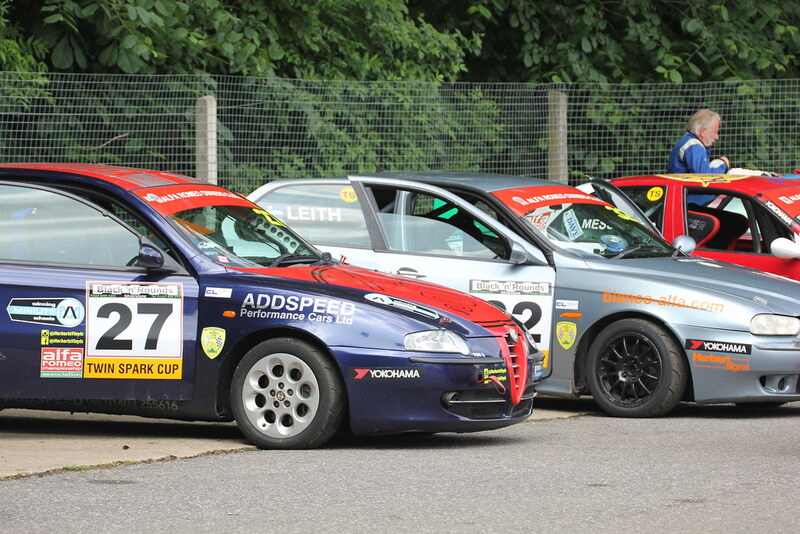 The two Punto Abarths of the McFie brothers were next, Chris pipping Simon by a couple of tenths with a best lap of 1:46.498, again right at the end of the session. Scott Austin had been 2nd fastest overall around mid-session, his decision to put wet tyres on the rear of his car looking to be a good one, but then the rears began to overheat on the drying track and he pitted after only 7 laps. His 1:47.406 was then beaten by the other runners – fine margins! 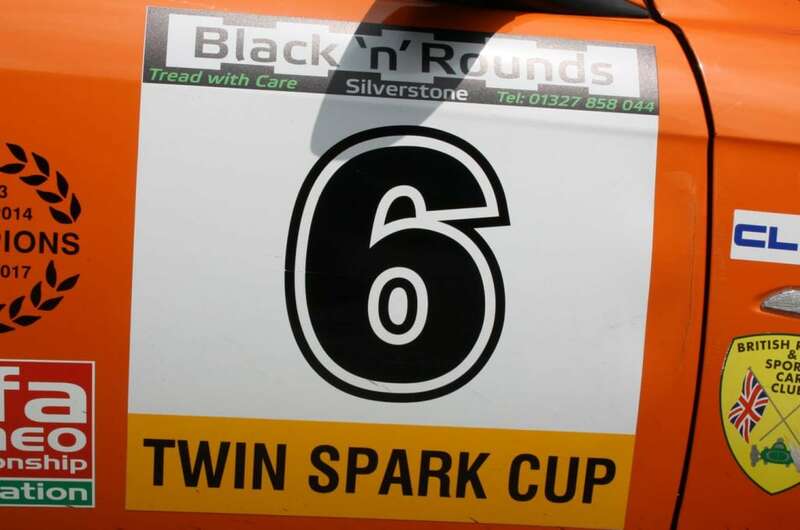 Nevertheless for the first time this season the slowest of the Power Trophy and Modified runners were quicker than the quickest Twin Sparks, an encouraging sign as that is an underlying assumption supporting the decision to have a split grid. 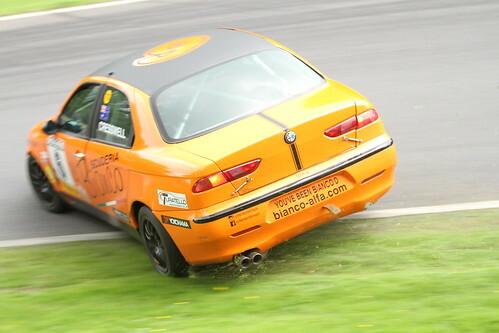 All in all, apart from Mike Tydeman’s incident, it was a trouble-free session, and Bianco were confident Mike’s car would also be race-ready later in the day. 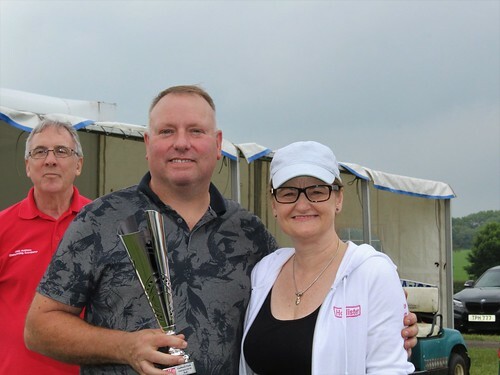 As the day progressed towards our scheduled race time of 16.00 the weather became increasingly hot and humid under overcast skies but remaining dry. However, as the cars were called to the Assembly Area, a very large black cloud had appeared overhead, looking ominously as if that was about to change. All the front grid runners were on slicks and there was no time to change to wets as the Paddock announcer’s voice became increasingly insistent. In the Assembly area, the chief marshal was predicting doom for the slick-shod cars as he surveyed the Modified and Power Trophy runners with a sorrowful eye. Happily his pessimism was unwarranted as it turned out because the weather stayed dry for our race. 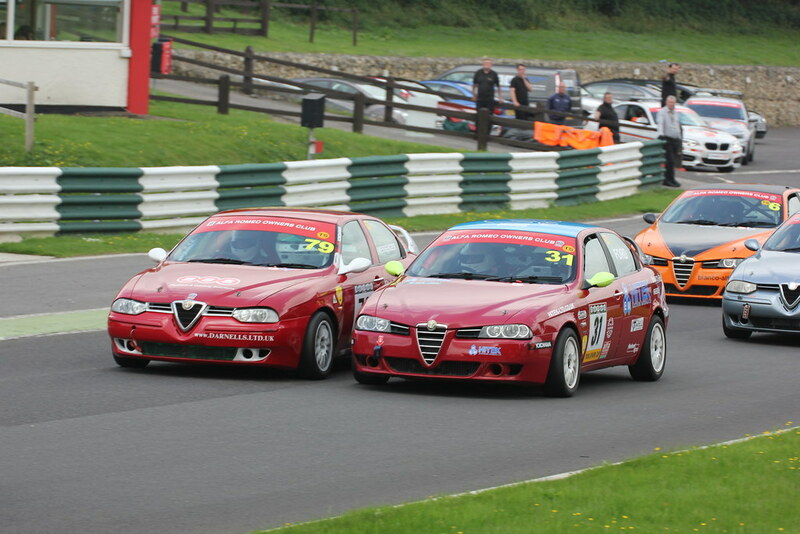 As the red lights went out the front grid cars all made good starts, getting away in grid order. 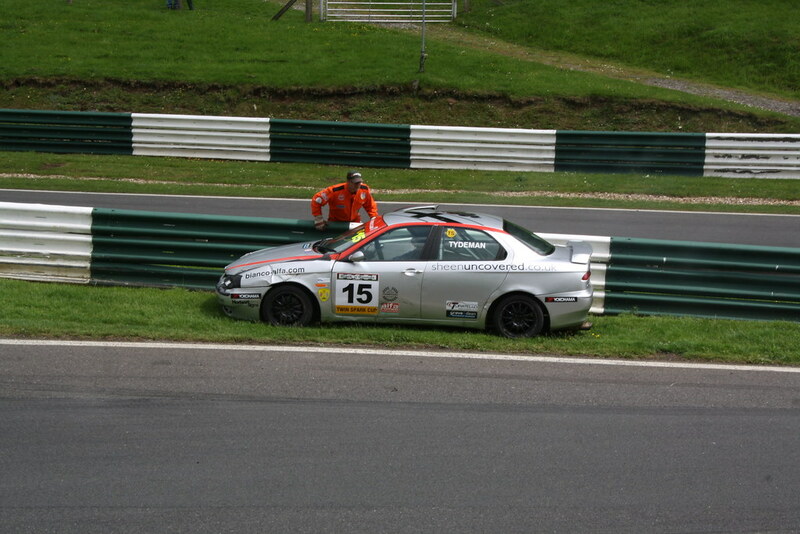 However, all was not well with Paul Webster’s car; by the end of Lap 1 he had dropped to 5th, having only been able to select 2nd and 4th gears with great difficulty or not at all. 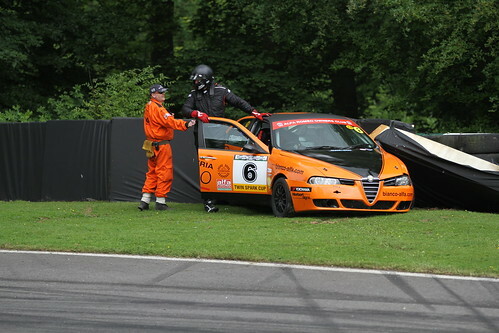 This problem was to plague him all weekend and he had to adapt to driving the circuit only with gears 1, 3 and 5. In general, things went smoothly for 3 laps with Chris Oxborough leading but with Chris McFie only half a second behind as they crossed the start/finish line. 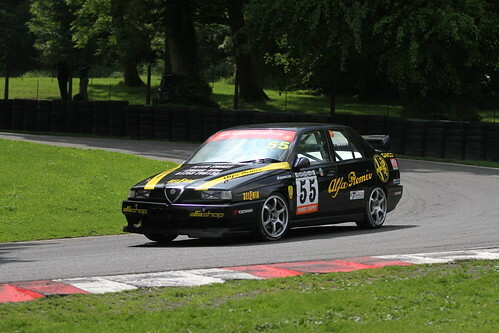 They went through Coppice in close order but as they were entering Charlies at the top of the hill the Abarth suffered brake failure and hit the 75 in the rear as it braked for the turn, pushing it into a spin on the track then onto the grass. 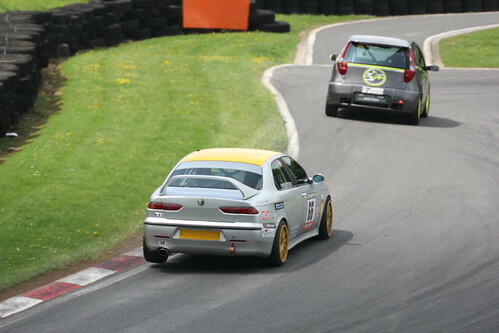 Chris Oxborough was unable to restart and as the car was in a dangerous position the Safety Car was called upon with an instruction of ‘Scramble!’ from Race Control – shades of WW2 – and Chris McFie crawled around to the pits to retire the Abarth. 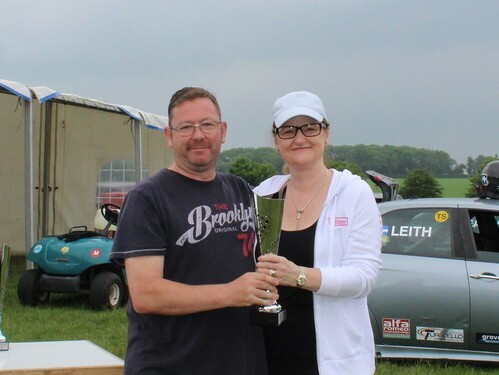 This unfortunate incident left Simon McFie in the lead – he was over a second behind the 2 leaders and this gave him time to avoid them when the incident occurred. 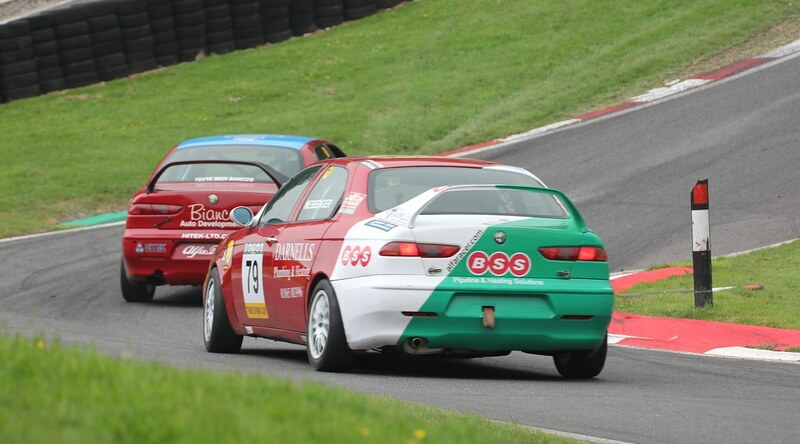 Meanwhile the Twin Sparks also got away well, Tom Hill making an excellent start from pole and Mike Tydeman following him through from the second row just quick enough to get the better of Richard Ford who was forced to slot in behind him as they went through Coppice. 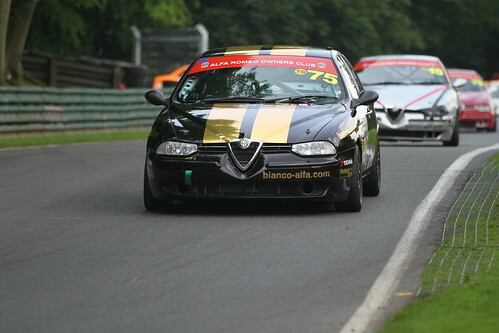 It seemed there was better grip on the left hand side of the start line because the same thing happened behind Richard, Dave Messenger getting ahead of Simon Cresswell, who was also passed by Kristian Leith on lap 1. 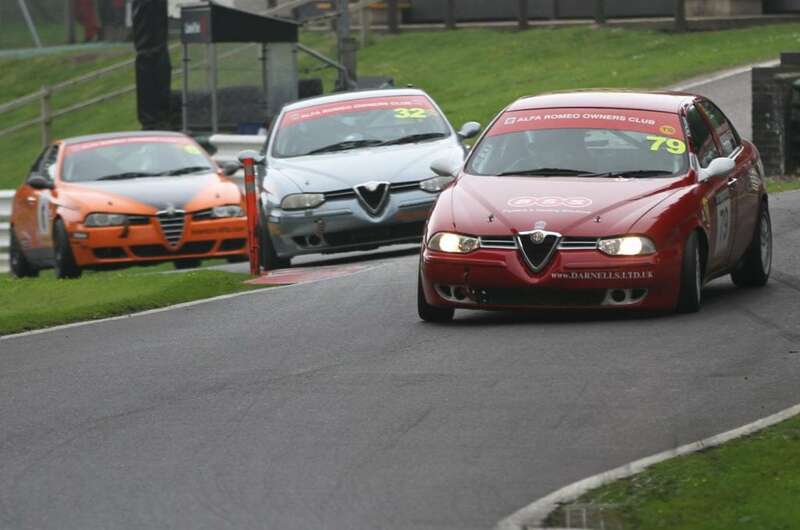 They were followed by Riccardo Losselli, Chris Healey and Andy Inman in that order. 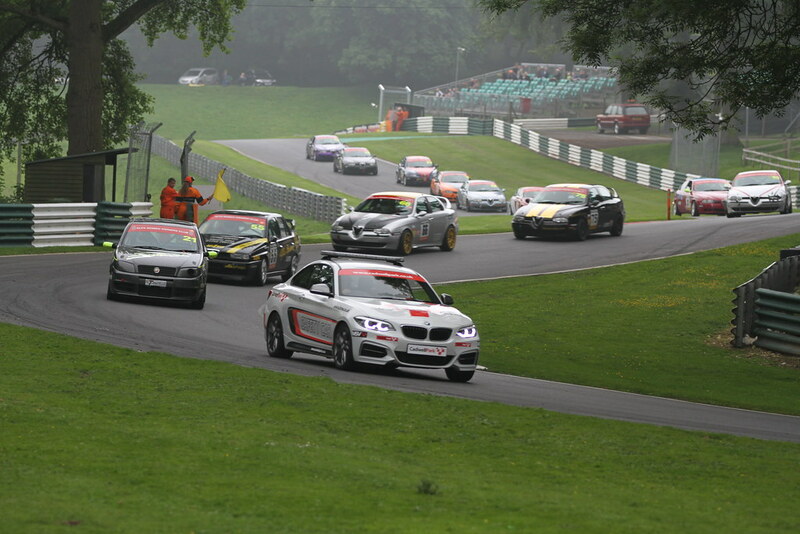 The Safety Car exited the pits just in time to pick up the leading group as it was completing Lap 4 and led the field around for the next 2 laps while the white 75 was retrieved. As the green flag was waved at the start/finish line at the end of Lap 6 to restart racing the order was Simon McFie, Scott Austin, and Paul Webster, closely followed by the 2 leading Twin Sparks, Tom Hill and Mike Tydeman. Richard Ford and Scott Austin, however, had been caught out at the restart and neither managed to get back on the power soon enough. This created quite a long gap between the 2 twin spark front runners and the rest with Richard just managing to stay ahead of Dave Messenger. Behind him the order remained unchanged: Leith, Cresswell, Losselli, Healey and Inman. 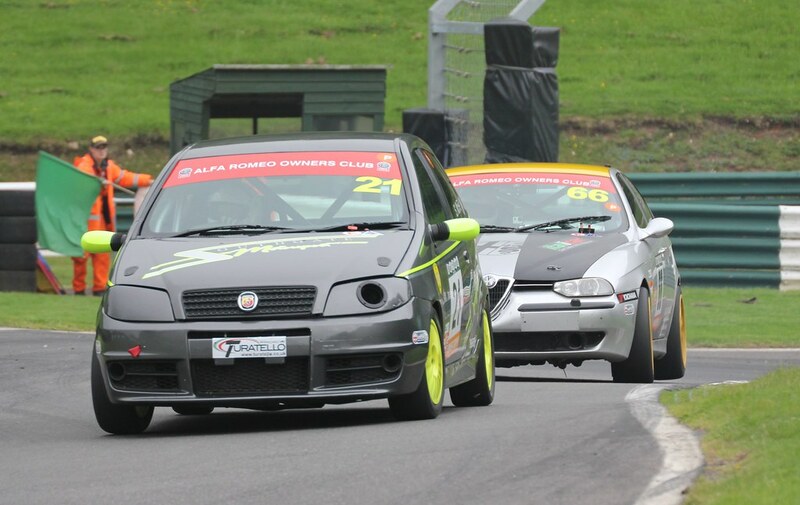 Paul Webster had taken advantage of the confusion to move ahead of Scott Austin and close to within half a second of the leading Abarth by the end of the lap. Lap 8 proved to be critical – Simon broke the Power Trophy lap record with a time of 1:45.762 whereas Paul was over half a second slower. On Lap 9 Paul lowered the lap record still further with a time of 1:45.197 and closed to within half a second of Simon again. On the final lap their times were closely matched with Paul unable to pass, finishing 3/10ths adrift of Simon at the chequered flag. Third was Scott Austin despite dropping away towards the end with overheating tyres and as a result of a ‘moment’ when he became certain that his recently acquired 155 did not have a limited slip differential! Among the Twin Sparks, Mike Tydeman pressed Tom Hill hard initially but then Tom gradually pulled away to finish nearly 3 seconds clear at the flag. Richard Ford was 3rd with an unchanged order behind him – Messenger, Leith, Cresswell, Losselli, Healey and Inman – illustrating how difficult it is to overtake at Cadwell without either a significant power advantage or the car in front making a mistake. 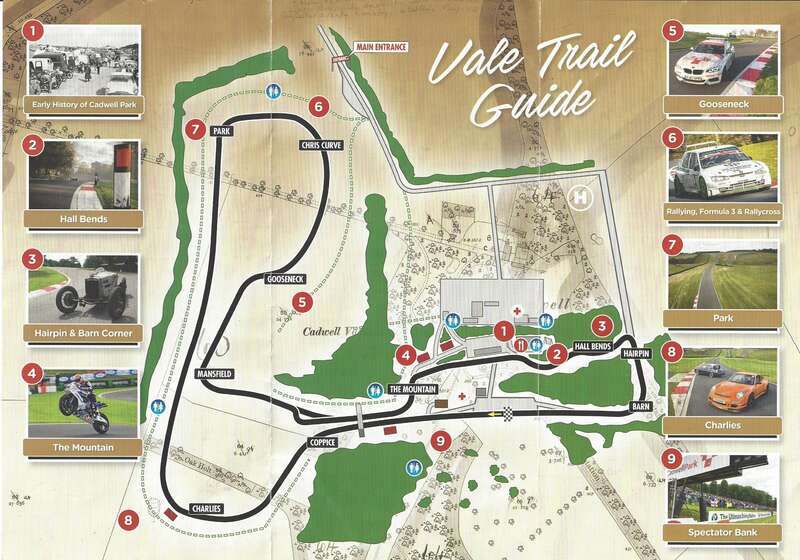 The forecast for Sunday was dry and cloudy with a few sunny spells, so a dry race was in prospect. 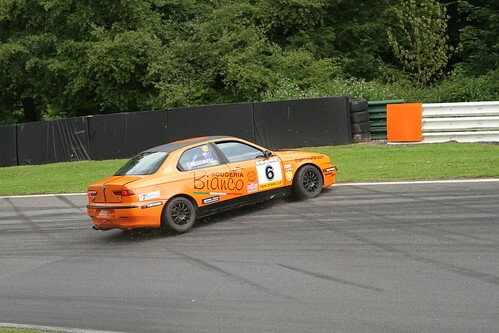 Brian and Dave Messenger had chipped in to hammer out Chris Oxborough’s near side rear wing so that the nearside rear door and boot lid would shut , Tom Hill’s car had the gearbox changed by Bianco, and others had more minor mechanical woes sorted out so that all 14 cars were able to take the start. Our scheduled race time was 12.35, just before the lunch break. 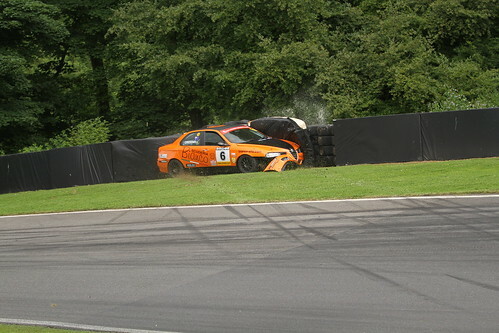 During the previous BMW Compact Cup race, there had been some incidents that resulted in barrier repairs being undertaken prior to any further racing. As our drivers waited in the assembly area, a call from the marshals came through to Race Control saying that the barrier repair would take another 15 minutes. As a result, the officials decided to take a 25-minute lunch break there and then. Simon Cresswell was fretting in the assembly area as he had to catch a plane from Heathrow later that day but eventually decided to stay, and the race started at 13:24. 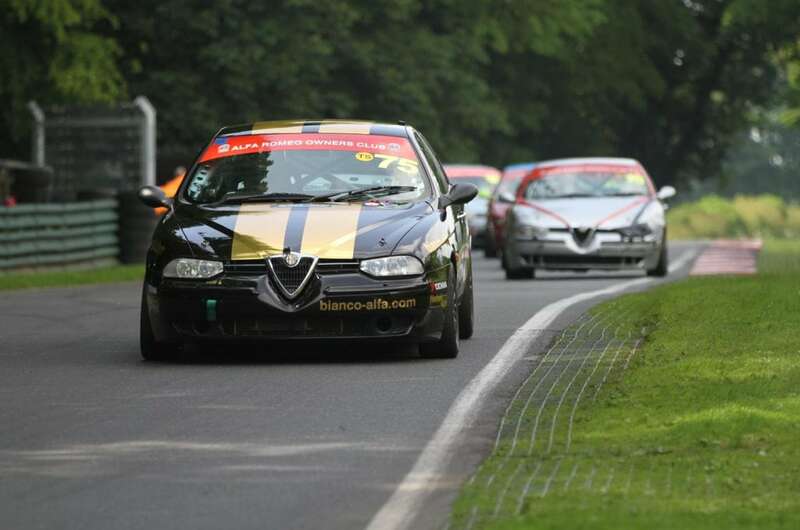 The front group made a good clean getaway when the lights went out, Chris Oxborough in particular, but as the cars approached Coppice he got boxed in and had to settle for 3rd place behind Simon McFie and Paul Webster, with Chris McFie and Scott Austin behind him. The Twin Sparks also got away cleanly with Tom Hill leading Mike Tydeman. 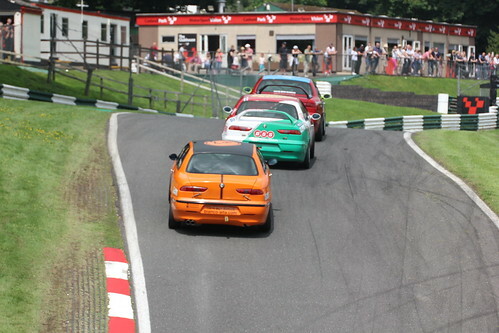 Dave Messenger outdragged Richard Ford into Coppice to take third, and the order at the end of lap 1 was Hill, Tydeman, Messenger, Ford, Leith, Cresswell, Healey, Inman and Losselli. The running order remained the same for both groups remained unchanged for the first 5 laps with one exception, Simon Cresswell passing Kristian Leith on lap 4. On lap 6, things began to change. 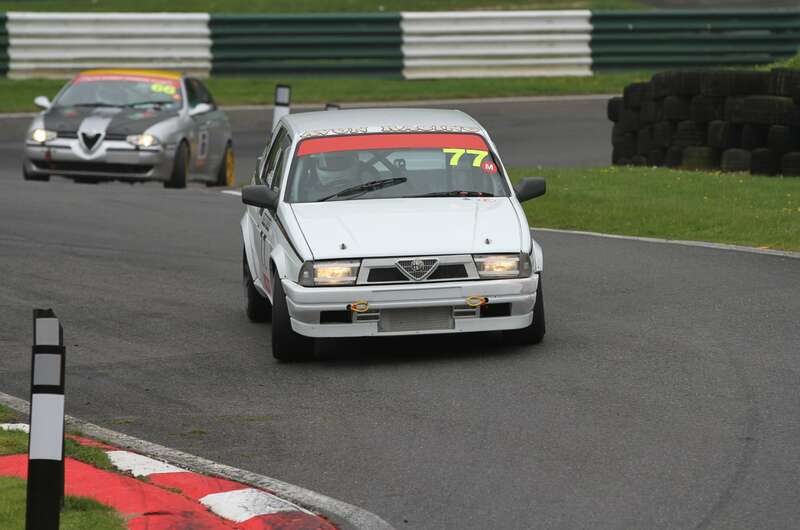 Chris McFie had been closely following Chris Oxborough for a few laps, biding his time before making a move down the inside at Mansfield that he was convinced he could succeed in making. However, Chris O shut the door, taking his normal line through the corner, and what we had all been praying wouldn’t happen did happen – there was contact; the Abarth did get through but minus a side window glass followed by the 75 minus a door mirror. 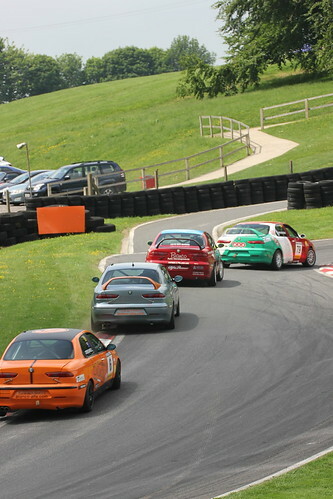 In the Twin Spark field, Tom Hill had opened up a big lead over Mike Tydeman in second place; Mike was fighting hard to fend off Dave Messenger and Richard Ford, helping Tom to pull clear although he was clearly quicker than the rest in any case. On lap 6 Dave Messenger was all over the back of Mike Tydeman’s car through Hall Bends and pulled alongside him on the outside as they entered the hairpin. He couldn’t make the move stick however, ran wide and Richard Ford nipped past him on the inside. 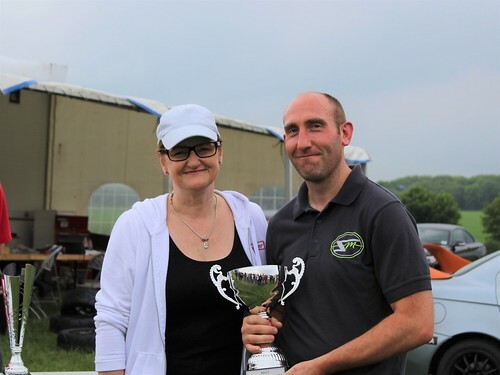 The 3 of them continued to run nose to tail through the next lap until Mike ran over the inside kerb at the gooseneck and cracked his sump – he continued down the hill but then had to pull off the track and retire from the race in a huge cloud of smoke. 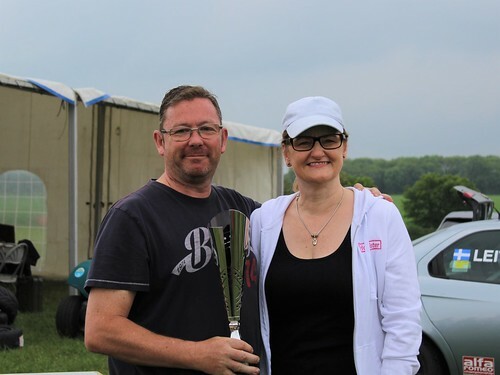 This let Richard and Dave through into 2nd and 3rd in class, but not for long… the marshals reported to Race Control that there was oil on the downhill section after the gooseneck but also said, erroneously as it turned out, that it was off the racing line. 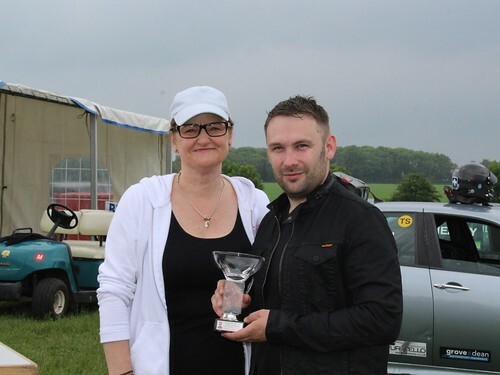 Richard hit the oil and slid off the track at Mansfield, losing 3 places to Dave Messenger, Simon Cresswell and Kristian Leith before regaining the track. Behind them Riccardo Losselli had passed Andy Inman on lap 6 and Chris Healey on lap 7, this group circulating in close order around 16 seconds behind Richard. 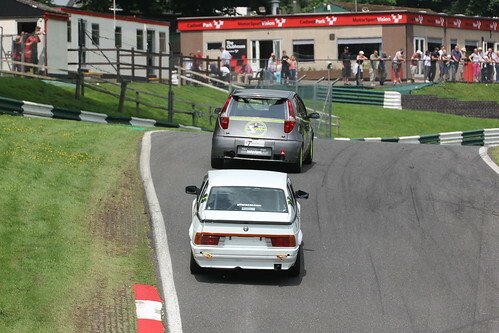 Meanwhile, right at the front, Simon McFie and Paul Webster were circulating several seconds clear of the rest. 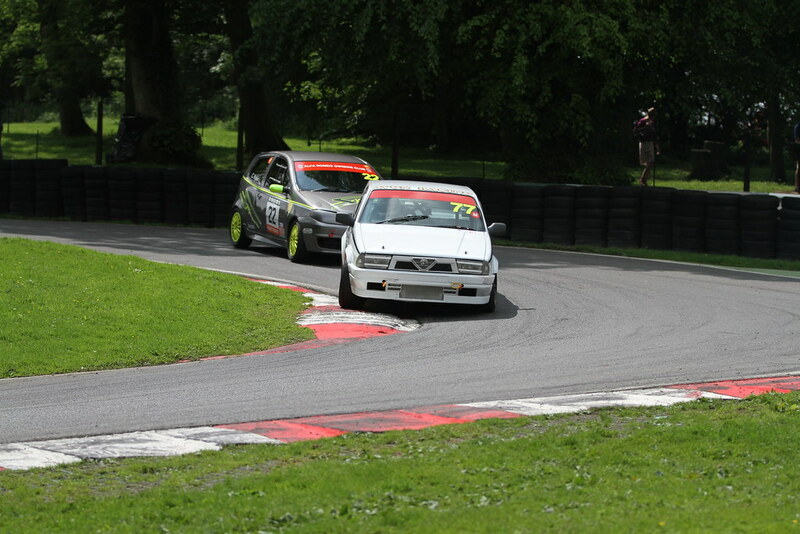 The gap between them varied as they swapped quicker laps, with Simon never able to relax in the lead. 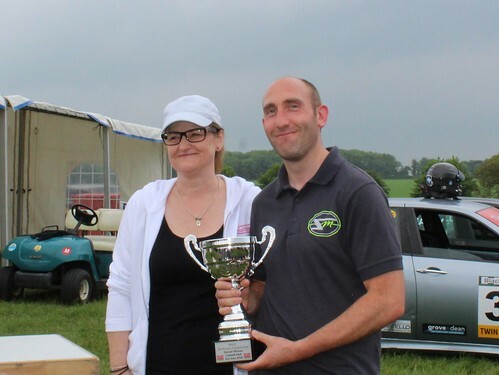 Paul broke the lap record again on lap 7 (1:45.099) but, try as he might, he could not get close enough to mount a concerted challenge and Simon drove superbly to take a lights-to-flag win by 7/10ths of a second. It might have been a different story if Paul had had the use of all his gears but both drivers had good reason to feel more than happy with the result. Chris McFie and Chris Oxborough crossed the line 3rd and 4th but what of Scott Austin? 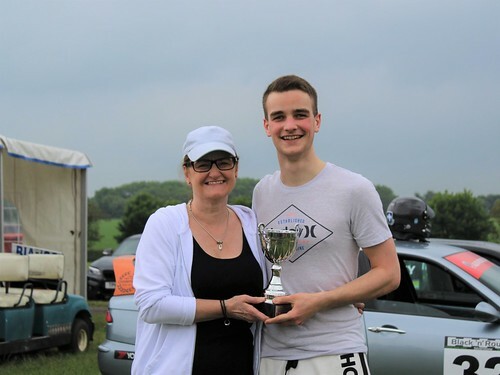 He was never able to match his pace of the first race and dropped slowly back in the opening laps before losing time hand over fist in the last few laps, eventually being overtaken by Tom Hill on lap 8 and finishing 6th overall. 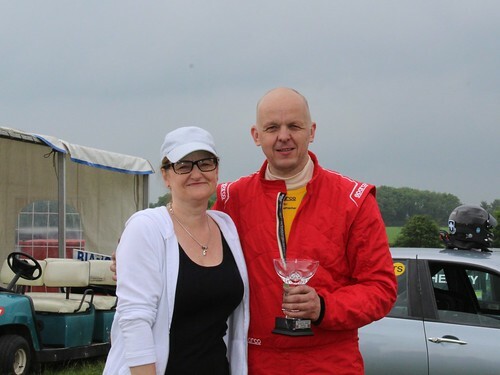 Tom won the Twin Spark class by some 14 seconds over Dave Messenger, perhaps the only surprising thing being that Andrew Bourke’s lap record of 1:47.058 set in 2017 was never at risk. 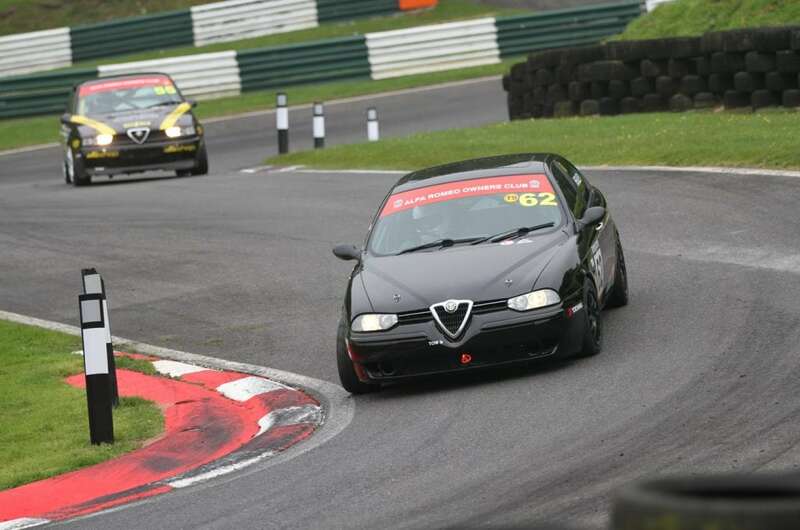 Simon Cresswell had been running third after Richard Ford’s off track excursion but then ran wide at Park on lap 9 dropping him to fifth and later that lap he went off and finished up against the tyre wall through the Hall Bends retiring his 156. A delighted Kristian Leith benefited to take the final Twin Spark podium place, Richard Ford was next, followed to the finish by Riccardo Losselli, Chris Healey and Andy Inman. 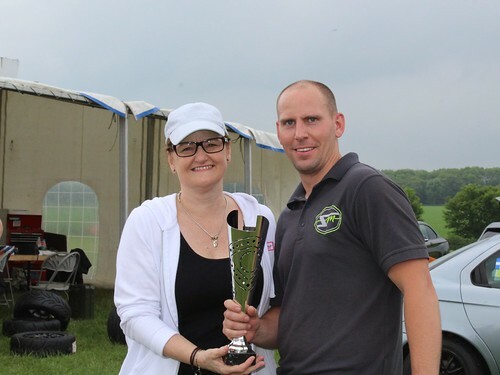 The weekend’s trophies were sponsored by Trent Trophies of Newcastle-under-Lyme – profuse thanks to the proprietor Dave Jones – and many thanks to Linda Hill for presenting the trophies and to Natalie Ford for taking the presentation photos. 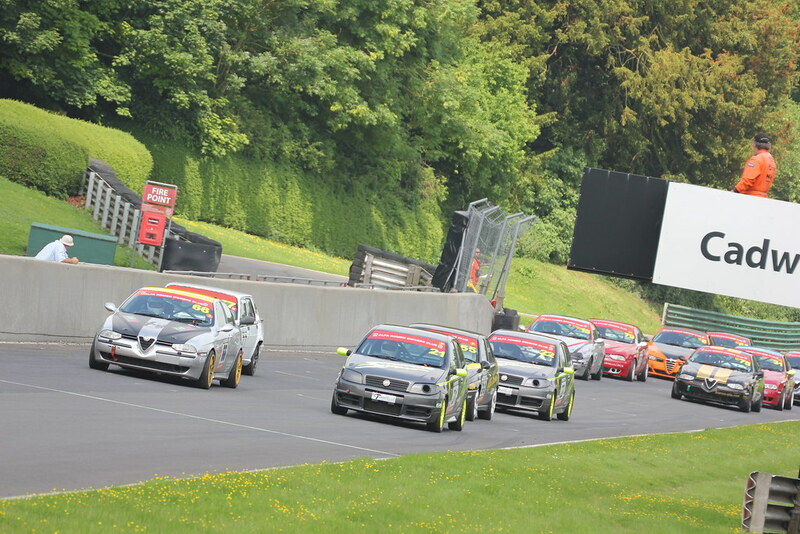 We now move on the Snetterton on 7th/8th July – as always, see you there!